Respected elders, distinguished scholars, and brothers and sisters in Islam as well as in humanity! Let me greet you all with the greetings of peace: Salamun ‘alaykum wa rahmatullahi wa barakatuh! At the outset, let me take this opportunity to extend my heartfelt gratitude to the conference organizers, particularly the Director of the Sadra International Institute, and generally to all the members of the steering committee down to the drivers and guides. This is my first to come to Indonesia, although I may look like an Indonesian or even more ‘Indonesian’ compared to some Indonesians. I come from Mindanao, the land of promise and the bastion of centuries-old struggle for self-determination in this part of the world. Before laying down my paper’s Statement of the Problem, let me first make some introductory remarks about behavioral economics and personal finance as well as about homo economicus vis-à-vis homo islamicus. I shall also clarify the kind of ‘debt’ which is the concern of this paper. After giving you the Statement of the Problem, I shall address the four secondary questions one by one and finally make a conclusion. What is lacking in both behavioral economics and personal finance is the role of the soul or spirituality which is a central theme in a monotheistic worldview. In classical economics, as in related academic disciplines, the economic actor is assumed to be an unboundedly rational, will-powered and selfish agent in which rationality is defined in terms of material gain and profit, without taking into account a notion of spiritual dimension. 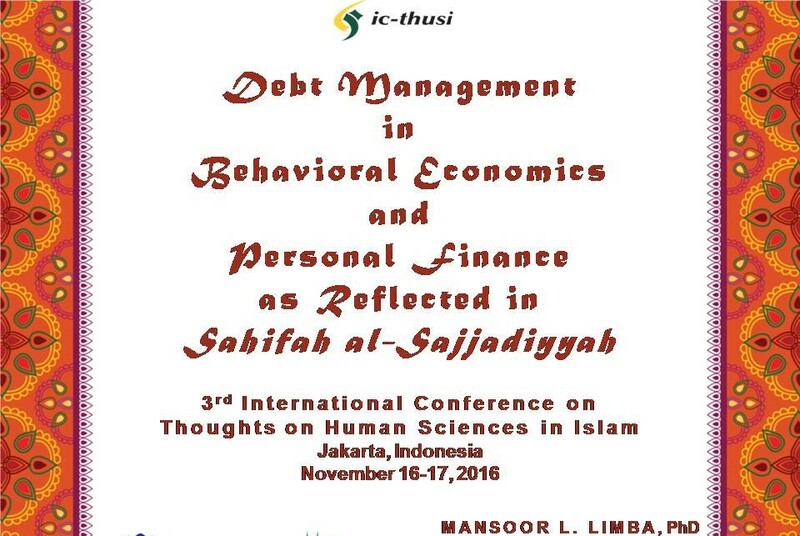 This paper attempts to examine the case of debt management in behavioral economics and personal finance through the lenses of Sahifah al-Sajjadiyyah which is a classical Islamic text on supplications. It is argued that by advancing the concept of homo islamicus and asserting the role of the soul in explaining human behaviors, the monotheistic worldview of Islam can shed more lights on the roots of economic or financial decisions, such as incurring debt, that are to be made by an economic agent. What is the definition of debt, in general, and consumerist debt, in particular? What is ‘debt’ in Islamic textual sources and history? What is Sahifah al-Sajjadiyyah and its Supplication 30 about? What is the description of ‘debt’ in Sahifah al-Sajjadiyyah Supplication 30 and its recommended steps or measures toward freedom from debt? Dayn (debt) is mentioned in Islamic sources (Qur’an, Traditions, Supplications, and Jurisprudence) and history in various ways. Meanwhile, there are traditions (ahadith) which indicate that debt sometimes stands in the way of spiritual progress. Some traditions condemn indifference in repaying one’s debt – and equates it with theft. There are also traditions that give warning for the spiritual consequences of habitual incurring of debt. In supplications (ad‘iyyah) transmitted to us, there is an explicit prayer for the repayment of debt. A very good example is Sahifah al-Sajjadiyyah’s Supplication 30 (Imam Zayn al-‘Abidin’s supplication for help in repaying debt) which is the main concern of this paper. Another example is the famous daily supplication during the month of Ramadan, which includes this line: “O Allah, facilitate the payment of every indebted one!” There are also transmitted supplications one of whose benefits is the repayment of debt for one who recites them. Among these supplications are al-Mashlul, Yastashir, and al-Mujir. Muslim schools of jurisprudence (fiqh) are unanimous in the ruling that the debtor who cannot pay his or her debts is one of the seven rightful recipients of zakat (alms-tax); therefore, he or she is given of the zakat to settle his or her debts. Also, when a Muslim dies, one of the four duties which need to be performed by his or her heirs is the payment of his or her debts. Regarding debt in history, let me just cite two examples. As Imam Husayn made an encampment in the plains of Karbala’, he purchased the site for the would-be graves of him and the other martyrs so as not to be indebted to the owner after the tragedy. Earlier to that, when Muslim ibn ‘Aqil was asked to disclose his wishes before getting executed, the last of his three wishes is the selling of his coat of arm so as to pay for the piece of land where he had to be buried. These two instances show prominent figures’ avoidance of incurring debt as much as possible and their firm resolution to repay once it is incurred. In sum, debt has been an important topic in Islamic sources (Qur’an, hadith, supplication, and jurisprudence) and history. Literally means ‘the Book of Sajjad,’ Sahifah al-Sajjadiyyah is a collection of supplications composed by Prophet Muhammad’s great grandson, ‘Ali ibn al-Husayn (38 AH/658-9 CE – 95 AH/713-4 CE), known as Zayn al-‘Abidin (`the Adornment of the Worshippers’) and ‘Al-Sajjad’ (‘the one who constantly prostrates (sujud) in prayer’). Sahifah al-Sajjadiyyah includes fifty-four supplications which make the main body of the text and the additional supplications which make up the fourteen addenda (including the prayers for the days of the week) and the fifteen munajat or `whispered prayers’. It is the oldest extant prayer manual in Islamic sources and one of the most seminal works of Islamic spirituality of the early period of Islam. Supplication 30 of the 54 main supplications is Imam al-Sajjad’s supplication for help in repaying debt. This initial part of the supplication is a window to Imam ‘Ali al-Sajjad’s description of debt and its potential maladies and repercussions upon the debtor. Among others, the Imam describes debt as: (1) something that may humiliate a person (debtor), (2) mentally disturb him, (3) emotionally burden him, and (4) a source of disgrace for him in this world and in the Hereafter. For any concern or problem of the believer – material or spiritual – he is supposed to extend his arms to the Source of Power and Knowledge, the Essence of Beauty and Grandeur. For relief from the burden of debt, one must sincerely pray and implore to his Lord and perform various acts of devotion. These parts of the supplication – “Give me sanctuary from it (debt) through a bountiful plenty or a continually arriving sufficiency,” “hold me back through Thy gentleness from squandering,” and “allow me to attain my provisions through lawful means” – may allude to having streams of lawful incomes as a very obvious step toward freedom from debt. This part of the supplication – “prevent me from extravagance and excess; put me on the course of … moderation” – may suggest an instruction to live below one’s means by maintaining moderation and avoiding extravagance and excess in spending. This segment of the supplication – “take away from me any possession which will bring forth pride in me, lead to insolence, or drag me in its heels to rebellion” – leads us to another very practical step to freedom from debt; that is, shunning any possession or item which belongs to the category of ‘wants’ rather than ‘needs’ and which usually causes pride and related moral vices to the owner. These portions of the supplication direct us to a significant step toward freedom from debt and a way to ample sustenance; that is, to spend for wholesome endeavors of devotion including alms-giving and spending for charity. As we all know, Islamic sources affirm the unseen or spiritual connection between the giving of charity and increase in sustenance. As shown in our examination of Supplication 30 of Sahifah al-Sajjadiyyah, the supplications handed down to us are full of pristine ideological doctrines and practical guidelines. A Muslim – that is, homo islamicus – is supposed to exemplify a kind of morality or lifestyle which is a manifestation of perfect regulation of the four powers or faculties (quwwat) of the soul, and the absence of the various vices of those powers, those of the Power of Desire in particular. Most important of all, the debt management laid down by Supplication 30 of Sahifah al-Sajjadiyyah exudes new conceptual insights into both behavioral economics and personal finance, and central to them are the concepts of homo islamicus and ‘Islamic rationality’ with the two distinct fundamental elements of a broader concept of success and time scale of the economic agent’s behavior. Thank you! Terimah kasi banyak! “Muslim Couple and Money” Published Today! 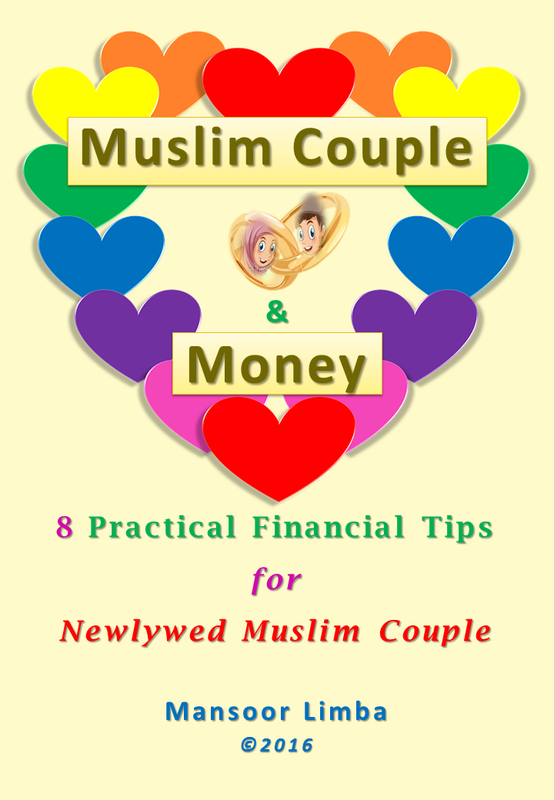 Mansoor Limba, MUSLIM COUPLE AND MONEY: 8 PRACTICAL FINANCIAL TIPS FOR NEWLYWED MUSLIM COUPLE (MuslimandMoney.com, 2016), $2.99. 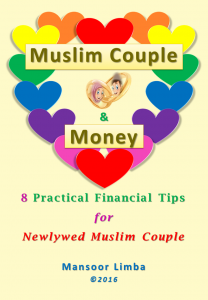 Published in both Amazon.com and Smashwords.com platforms, the eBook is a personal finance guide that reveals 8 practical financial tips for newlywed Muslim couples to help them attain financial freedom and happy marriage. 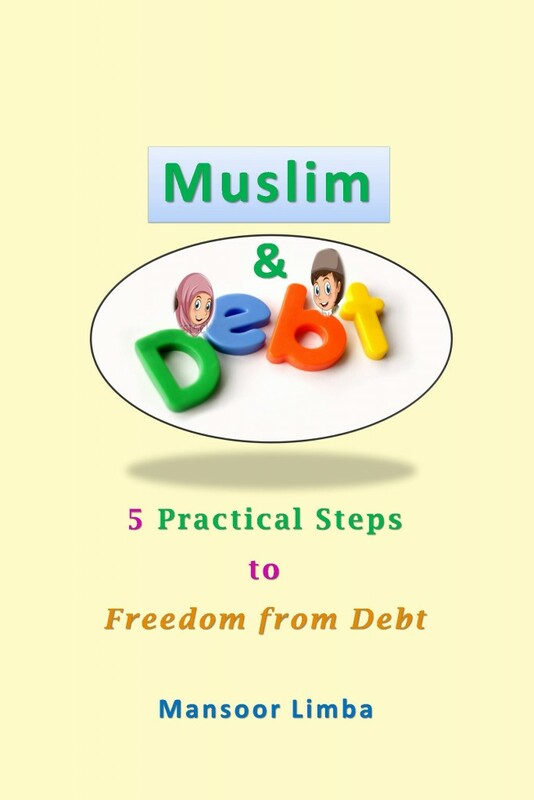 This title is part of the Muslim and Money Book Series. The other titles are “Muslim Kid and Money: 12 Financial Stories for Muslim Children” and “Muslim and Debt: 5 Practical Steps to Freedom from Debt,” which will be published soon, insha’ Allah. 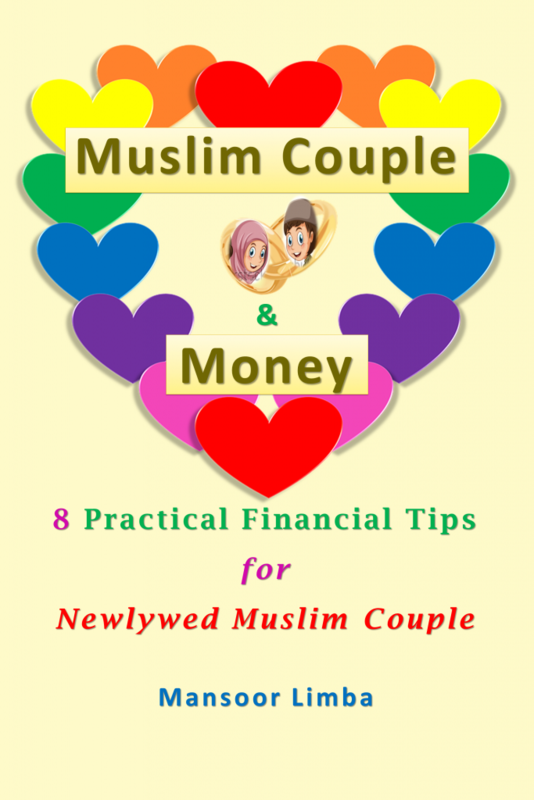 Mansoor Limba, MUSLIM COUPLE AND MONEY: 8 PRACTICAL FINANCIAL TIPS FOR NEWLYWED MUSLIM COUPLE (MuslimandMoney.com, 2016). The book will be published next month (September 2016), insha’ Allah, through both Amazon.com andSmashwords.com platforms.